Transfer via Hotel Hoppa at £5 per adult. Located just a few minutes away from Heathrow Airport Terminals, the Hilton Garden Inn is a modern hotel with great facilities. Relax before you fly in the contemporary surroundings of the hotel restaurant, enjoy a drink in the stylish bar or workout in the fitness room the choice is yours. All rooms are air conditioned with spacious bathroom and luxury toiletries. 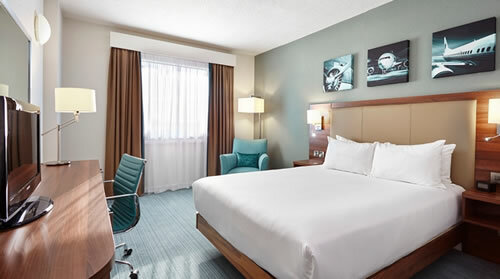 Rooms also provide a work desk and flat screen TV. Free Wi-Fi and 24 hour room service available. The hotel has accessible rooms which are available on request. Please call FHR for more info. Transfers via the Hotel Hoppa. The H9, H53 and H56 Hotel Hoppa Buses all stop at the hotel. The H9 is from Terminals 1, 2 and 3, and the H53 and H56 operate from Terminals 4 and 5. Transfers via the Hotel Hoppa are charged at £5 single per adult. Children under 15 travel free. The Garden Grille serves a selection of nutritious dishes or enjoy the add day bar menu in the Garden Lounge. The Pavillion Pantry offers a range of sweet & savoury snack as well as soft drinks and alcoholic beverages and is open 24 hours a day. The hotel has a Fitness Room which amongst other equipment has treadmills, and free weights. Booked one night at the Hilton Garden, with up to 15 days parking included. Only slight concern was that two receptionists were unaware, of the parking package supplied by FHR.. and could not see the reason why I insisted they add my vehicle registration number onto their system. When I explained that in an event involving the car, ie caught fire, driven into etc etc, it would identify the owner, and thus the booking. They appeared not to care. but did add the regn no to appease me. Other than that, no problems, had to get the initial parking ticket on entry authenticated again, upon return from holiday, but other than that all was well. Would use Company (FHR) and Hotel again. Very happy with telephone booking service. Hotel friendly and comfortable. Food and drink from the bar reasonably priced for an airport hotel. 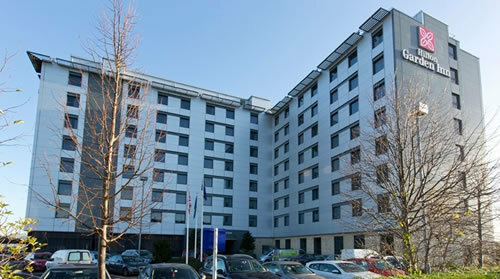 Will book with FHR in future and will use Hilton Garden Hotel at Hatton Cross again too. Exit at Junction 2. Take a left following signposts for Staines and Hounslow. Then take the junction with B455 and at the roundabout take the 2nd exit. At Gillette Corner at junction B454, continue straight through the traffic lights following signs for Osterley Underground Station. At Henlys Roundabout, take the 1st turn to join A30 following signs for Staines.